This badge was issued to Sol Toder on 12 Jan 2018. The badge earner has the ability to innovate on the mainframe by solving real life situations encountered by experienced systems programmers. This individual has demonstrated their extensive programming skills (advanced commands, system setup, and advanced system navigation) and is able to develop application tasks (C, JAVA, COBOL, assembler and REXX), Through hands on experience, they have demonstrated an ability to work with multiple operating systems (Linux on z Systems, z/VM, z/OS, z/TPF). Must currently be a student at a high school, college or university, and at least 16 years old. 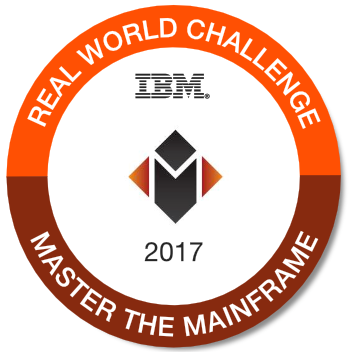 Registration in the IBM Master the Mainframe contest for 2017. Completion of the IBM Master the Mainframe - Part 2 contest and earning the Master the Mainframe - Part 2 badge (current year or any previous year). Completion of the IBM Master the Mainframe - Part 3 contest for 2017. Note: The 2017 contest is now closed.